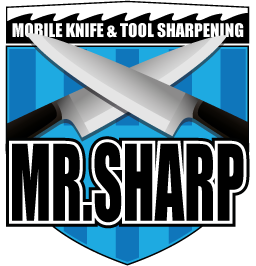 Mr Sharp has been established since 2014 and has continued to be Melbourne Premier Knives Sales & Sharpening Specialists. Our company services the sharpening requirements of over sixty customers comprising both the public and private sector. This includes six schools, Colleges, and Universities. All Sharpening work on standard paper cutters & trimmers is completed on site thus providing the customer with minimum inconvenience. We also specialize in sharpening knives & scissors for personal and professional use. Not only do we service Knifes, Scissor, Trimmers & Tools also supply them. This means that you the customer can be assured of full maintenance & sharpening of blades annually or as required. Call or e-mail us for more details about our Sales & Sharpening service. Had our Fissler knives sharpened at home today by Scotty’s mobile knife sharpening service. What a fantastic job he did! Absolutely as sharp as new. Our neighbor came over with her valuable hand crafted knives too and she was equally impressed. At $10 a knife, Scotty certainly offers great value for money. I unequivocally recommend Scotty’s knife sharpening service for quality workmanship and service. Took all our knives to the Torquay Market this morning for sharpening. Scotty dropped them off at home for us later in the day as he was so busy! Great service & Wow, the knives are like brand new again. Need a tinker to help you tailor? Scotty is the man for the job. I had my vintage (circa. 1920’s) pinking shears sharpened and they went from horribly blunt to cutting in perfect, clean zig zags through fabrics both thick and thin. My normal dressmaking shears are also cutting better than new thanks to Scotty’s expert scissor sharpening skills!